At the time when Ahmadinejad was welcomed by some Lebanese who have benefitted from Iran's handouts, these human tragedies took place in Iran. - The 10 year prison sentence for Hamed Rouhinejad, the Iranian student who suffers from MS, has been extended by a further year. Ahmadinejad's sadistic torturers have sent Hamed to a remote prison and banned his family from visiting him despite the long journey they made to see their son. Hamed has been denied his medication. Hamed's father said "My son is dying, he is now 50% paralysed and is unable to perform his daily routines by himself. How is he a threat to national security?" Hamed's father has had three strokes since his son was arrested. - Iranian imprisoned human rights lawyer, Mohammad Olyayi Fard, who is in prison for defending his client, is feared to have leukemia. - Iranian imprisoned human rights lawyer, Nasrin Sotoodeh, who defended her colleague, Olyayi Fard amongst others, is still in prison without being charged and on 18th day of her hunger strike. - Iranian IT genius, Hossein Ronaghi Maleki, sentenced to 15 years prison is also on hunger strike and his family are not allowed to visit him. - Four Mourning Mothers, mothers of those martyred in the protests last year, have been arrested, charged with contacts with Zahra Rahnavard. - Iranian teacher, Abdolreza Ghanbari is facing execution for having taken part in the Ashura protests. - Families of political prisoners like Parvin Tajik, Elaheh Mojaradi, Akram Neghabi and her daughter have been arrested for no other reason than being related to the prisoners or talking to the media about the plight of their loved ones. and the list goes on. It seems one solution that will make both Iranians and Lebanese happy is for Ahmadinejad to stay in Lebanon. Look as tragic as the regime's crimes are, why don't you pay attention to a possibility that is far worse? What happens if the Islamic Republic gets nukes and then decides that martyrdom is such a wonderful thing for themselves and for the citizenry of their nation that they exchange nukes with Israel? What happens then? What would you think if such a scenario came to pass? Perhaps you should do an article about it! The so-called "crimes" of the Iranian "regime" are nothing compared to the murderous policies of the US government and its Zionist attack dog in the region. 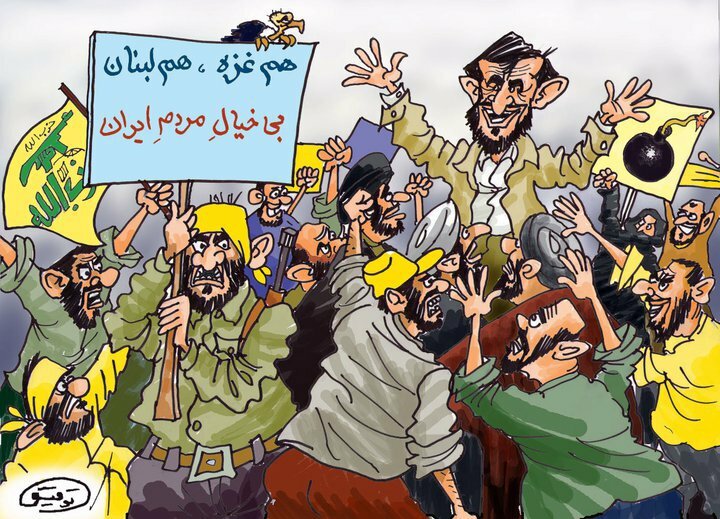 More Iranians have been killed by US-sponsored terrorism - PJAK, Jundallah etc - in the past year than during the 8-month sedition.